If you have a window or door that sits flush or proud of the wall, you probably then have trim sitting on the wall. This can be a problem area for moisture. Most often with brick homes, your windows and doors are set slightly back from the surface of the wall. This is the case in my home, which is all brick. My main concern is the bricks at the bottom of the window should be angled to let the rain water flow away from the home. On homes with a cladding on the exterior wall, you find that the windows or doors could be set either flush to the wall surface, or even a little proud of that surface. In this case, you find that the windows and doors have trim pieces around them. Now imagine what happens during a rain: the water hits the wall, rolling down to the ground. If the rain hits above the door or window of a home where these features have trim around them, then you will want flashing. Take a look at the following photos. These pictures were taken of the same home. The one on the left is of the trim around the door, and the one on the right is of the trim around the window. Look at the top piece of trim in both photos. From the trim over the door, you will notice a piece of metal capping the trim. Looking at the trim over the window, you will not see this piece of metal. This flashing is sometimes called z-flashing, because it is formed to look like the letter z in profile. One edge of the the z goes under the wall cladding. The middle part of the z sits on top of the trim piece. The last line of the z bends over the front of the trim. If water comes down the wall, it will hit this metal, which is angled to force the water over the front of the flashing. If the metal is not there, water could go behind the trim into the interior of the wall, causing moisture damage. The reason for having an arm of the z go up behind the cladding is to better ensure that no water could wick up the reverse side of the cladding due to surface tension. 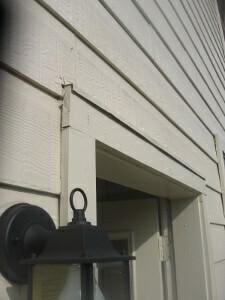 This simple part of the home is easy to over look, yet this flashing can prevent a good deal of damage. I think it strange that the builder would do the flashing over the doors, but forget to install these flashing pieces over the windows. What is the solution to this missing flashing? First, let me be clear on what I mean by cladding. Any material like wood or cement boards added to a home’s exterior is cladding. There are different exterior wall coverings like brick, stones, or stucco that do clad the wall, but I am referring to something that probably looks like wood on your home. I should mention that I have seen this way of installing windows and doors on stucco homes as well as the cladding that I mentioned. Probably the best solution is to remove the cladding to install the flashing in the z-flashing style. However, I realize that this may not always be practical, particularly on a stucco home. (Note: many contemporary stucco homes have trim piece that look like stucco. These could be made from EIFS or metal, and their finish seal at the top.) If you cannot take the step of removing the cladding, the next best solution is to make a z-shape where the top leg of the z attaches to the surface of the wall. In this case, be sure to caulk behind the entire length of this flashing leg to prevent water from coming in behind it. You can paint the flashing to match the house colors. Also caulk the nail heads that are going through the flashing face. If this does not appeal to you in looks, then shape the flashing like the letter L. Slip the one leg of the L under the cladding with the other leg over the face of the trim. Nail through the top of the trim. 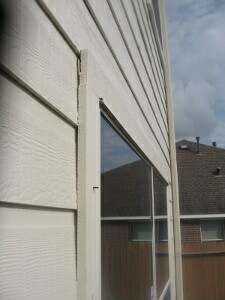 Caulk the nail heads, and run a bead of caulk between the flashing and the cladding along the length of the trim. Is this really a problem to be concerned about? I am asked this question after a home inspection. We are standing in front of a house that is nearly ten years old, and their does not appear to be a problem with moisture behind the trim. Granted that sometimes there is no problem for quite some time. On other homes, you will see moisture damage in the trim happening faster, and you can be sure that moisture is in the wall. There are many factors as to why one home has damage, and another does not. You may not have to run out and make this repair tomorrow, but this should be on your list of repairs to make. Homes change, and you may find one day that you have a problem. This entry was posted on Tuesday, November 2nd, 2010 at 2:40 pm	and is filed under Home Maintenance-Consumer Info. You can follow any responses to this entry through the RSS 2.0 feed.